A newer version of the Bluetooth network monitor can be read about here, but I’d recommend carrying on reading this post first. The monitor uses an ATmega328P @ 20MHz, 160×128 1.8″ colour LCD, a Bluetooth module, is powered by USB’s 5V, has a button for changing LCD brightness (long press) and display mode (short press) and since it’s powered by USB I added support for V-USB. The plastic part with everything screwed on to is an A8 paper display holder with the back clippy part removed and some rubber feet added. I’ll probably add more display modes sometime, like showing CPU usage etc. from the PC that its getting power from by making use of V-USB. The router (my router is a PC running Debian Linux) runs a shell script which gets down and up speeds of the WAN interface, first hop ping, ping packet loss, WAN IP and everything else, it then sends this data to a serial port (which in this case it’s a USB-to-serial converter using a CP2102) with a serial Bluetooth module attached, data is then sent to the other Bluetooth module in the net monitor which is then displayed on the LCD. To get modem down and up sync speed a CGI script is ran on the modem, normally you’d have to parse the ADSL status page of the modem, but since I’m running OpenWRT on my Netgear DG834Gv3 I just needed to make a small shell script to get the ADSL status from a /proc file, well there is still a little bit of parsing, but not as much as you’d have to do with a normal HTML status page. I might sometime code up a proper program in C instead of using a shell script, it’ll use up a lot less CPU time while running and make it possible/easier to use a more efficient binary protocol. This was also my first experience with SMD parts (0805 size), I think it went very well, but little bit messy in some places, my future projects will probably be mostly SMD from now on. I also made a small utility for converting the red channel of images into a byte array representing the intensity of each pixel, colour is added on-the-fly by the the controller based on the intensity, allowing multiple colours of the same image or font without using up extra flash space. reduces program size by around 2KB (now 16,836 bytes), saves 18 byes of RAM (now 301 bytes, that doesn’t count runtime stuff which tops at around 1KB) and gains a few extra FPS. Using -Os instead of -O2 would give an even smaller code size, but at the cost of performance. Normally it wouldn’t be 255.255.255.255, I just manually set it to that while doing the video and taking pictures. 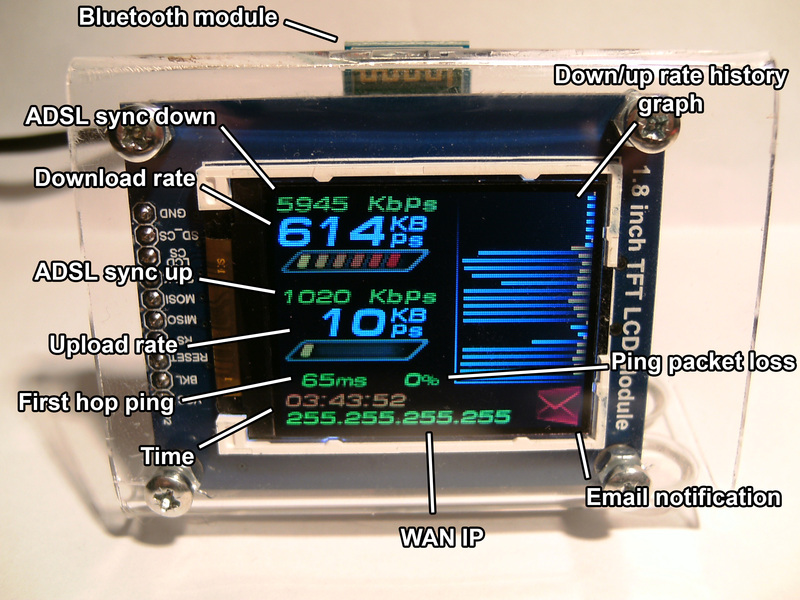 Where did you have your PCB’s made and where did you get the LCD? The PCBs were made at OSH Park. The LCD is from eBay from a Chinese seller for around £8, search for “lcd module 1.8”, the LCD is meant for 3.3V so if you use 5V you’ll need to find a module with level conversion built in (which the one I’m using has) or you need to add it yourself with a load of resistor dividers/resistors + zeners. Simply beautiful! I’ve been looking to build something exactly like this – which is probably going to require that I switch from my Netgear router to a small box running Linux for the router. I wonder if it’s possible to run a router off of some of the new dev boards coming out – as I want to minimize the power draw of any constantly on device. Looks great – what font did you use? Thanks, I used this font in bold italic. 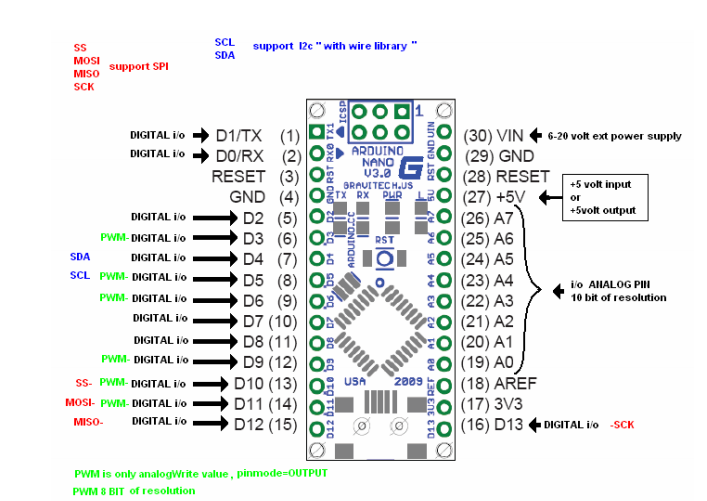 In the write up it says you use an ATMEGA328P but in the schematic it says it is an ATMEGA328, I am fairly new to microcontrollers, is there any difference between the ATMEGA328P and the ATMEGA328. I have been looking around on Digikey and was wondering since they list several part number such as the ATMEGA328P-AU-ND, ATMEGA328P-AURCT-ND and such, are each of these the same chip and programmable identically with the exception of the package type? The P means picoPower, it helps reduce power consumption in sleep mode by allowing you to disable brown out detection, but that feature isn’t used in this project. The P version counts as a different controller when you program for it, but the same code will work on both P and non-P, you will just have to remove any extra power saving features when you compile for the non-P version. The rest of the extra letters are the package type and how they are packaged, in a reel or tray, and don’t count as different controllers. All the ICs are programmed the same way, by SPI or if you’re using a boot loader then by UART. Nice one =) But where did you find the information, how to address such a display? The eBay seller for the LCD had a link to an Ardunio library called TFT18 which appears to use code by Rossum to get the display initialized (can’t find an official link, a bit more info about the display and the lib here), then to send image data its just a matter of setting a pin high and sending 2 bytes for each pixel. You mention the script runs on your Debian router, I suppose you could easily run the script on the OpenWRT box directly and use the serial port on the router? Was just the lack of BT on the router the reason for this? The script could run on the OpenWRT modem and have the BT module connected to the serial port, but I think all the output when it starts up is also printed to the serial connection so I’m not sure what will happen there. It would still have to get some data from the router like the WAN IP and the PPP end point IP for it to ping. The router is also a full PC compaired to the low powered modem. If it’s just a normal modem/router with OpenWRT then gettting it working with the internal serial port shouldn’t be a problem. What was the build time on this and can you make these for sale. Getting it built took less than a day since it was only drilling holes in the plastic for the screws and soldering the board, the part which took the most time was designing, coding and waiting for parts to arrive. I first came up with the idea way back in May 2012, but didn’t start on it until October and finally finished in January. These aren’t for sale, or at least not yet, see the comment about a Kickstarter below. Reason i’m asking is I’m 72 years and that’s beyond my expertise and I like that. Hi forgive me i know very little about electronics but if i were to build such a project how would i go about adding a bigger display? im assuming its not as simple as just swapping them out? Zak, have you thought of making this into a Kickstarter project and selling it? You’d have to find a way to make it work with the popular routers out there (most don’t offer shell access), but I’d buy one. Well, a Kickstarter definitely wasn’t something I was look at doing, I think I’ll have to spend a lot time getting it into a state where it can be manufactured which I don’t have at the moment because of university, but I finish in ~4 months so maybe then. nice little project. For me the biggest problem is smd! 🙂 How was your experience? Especially soldering the hole stuff. The IC was the first thing I tried to solder, trying to solder each pin individually didn’t work out well at all lol, so off to youtube to watch some videos about SMD soldering… putting loads of solder all over the IC pins then use a solder sucker or wick to get the excess solder off and you’re usually left with a nice set of soldered pins, sometimes the solder will bridge some pins and won’t want to come off, add a load more solder to the bridged pins and use the sucker/wick again. Use very small amounts of solder on the resistors and capacitors. A pair of tweezers helps a lot! Great project. Can you post some details about the specific bluetooth module you used? This post has more info about the modules, they’re from eBay from a Chinese seller. Is there away to upload the files to the chip using windows? AVRDUDE is what I use to upload, it’s cross-platform. Im new to this uploading to chips. I got Avrdude download. So is it the hex file im uploading? How does all the rest of the files get loaded? Yep, just the hex file needs to be uploaded, the rest of the files are the source files so you can change stuff. So the avrdude you using is running in cmd? I found one called avrdude-gui. Seem it not locating the chip when i run hex file. Thanks for your help :D. It a start for me. Yeah avrdude is ran from cmd, but there are GUI programs for it as you found. Not finding the chip could be for a number of reasons (incorrectly wired, no crystal), have a look at some tutorials like this one. actuall found a nice xloader v1.00. saying it uploaded the file, so now im wondering my wiring maybe wrong. nothing but white screen. Do you have a crystal connected? Maybe post a picture of your set up. Here a list of items im using. when i get back ill take a snap shot of my layout. Can I make this off the standerd Arduino board? Yes, it should work, however I’m not sure if using the UART port for the Bluetooth module will work or not, since normally you can only connect 1 thing to the UART port and for Arduino boards that would be the FTDI chip. I saw this and was like I just have to have it dammit! Im getting a starter kit, but I cant seem to find the LCD. here some pictures of how i got it layout. on the plus side, i now getting a dimmer affect on the screen, but still a blank screen. It doesn’t look like the LCD VCC is connected to 5V. I think you have LCD RST connected to nano RESET, they are different things, LCD RST should go to D7. LCD SDA looks like its connected to GND. It looks like you have the BT module GND connected to VIN on the nano and VCC connected to GND, VCC should go to +5V and GND to GND, a red LED should be flashing on the Bluetooth module if its working. You don’t need to connect the pins for the SD card. There may be other mistakes, but its difficult to see where exactly the wires are going. Thanks, yeah realize bluetooth was backwards. does res and cs need to be connected? my bluetooth blink read light like you stated. Yeah, RES and CS need to be connected. Only option to check would be to make sure software loaded right. I got everything else working. Im using arp uploader. this is the parmas it showing. i tried changing what you had told me earlier, nothing. ARP uploader comes with an old version of avrdude, you’re better off getting the latest version and using command line to upload the hex. I’ve modified avrdude.conf to support ATmega328 non-P version, which the nano uses. You might have to change COM3 to whatever COM number your nano shows up as. had to add the b57600 to get it to run. how will it read the other files? How does the images and stuff get loaded to the screen? Sorry for being a noob, never program a chip before. The images are all stored in the .hex file, you don’t need to worry about getting any more stuff onto the chip. Last question, then lay this to rest. my board is similar to this. i wired it closely as possible to this diagram, and all i still get is white light screen. SCL and SDA on the nano diagram are for I2C, the LCD module uses the same names, but it uses SPI which are the SS/MISO/MOSI/SCK pins on the nano. now just got to pair up a bluetooth and im done. I just realised the nano runs at 16MHz, but the hex file is compiled for 20MHz so the baud rate for the Bluetooth module will be incorrect. Heres the hex compiled for 16MHz. made a simple schematic of the parts i used. Red wire is connected to RST on the nano, should go to 5V. Only way i can see to type AT into the black box is to copy paste it in. But i dont get no yellow text to show up saying ok.
Is there a better turtioral on this? Googling for ‘hc05’ and ‘linvor’ gives a number of results, but most only show how to setup a single module and connect your phone to it. Another console program you could try is Putty. Yeah i tried putty, arduino, hyperterminal, and even realterm. When i type AT, nothing gets returned. Im using a jy-mcu module. Led is fiashing red. I think u can use a generic bluetooth dongle such as this(http://dx.com/p/super-mini-bluetooth-2-0-adapter-dongle-vista-compatible-11866) for the PC side transceiver instead of the CP2202+bt module combo. Almost all bluetooth dongles support SPP. ,and with some minor modifications (changing the port name! ) in the PC side script you can make any USB bluetooth dongle talk to the bluetooth module. So with this, i could set my bluetooth module? You still have to use the JY module for the Arduino Nano part, but the module that plugs into the PC/router can be swapped for one of the mini USB dongles. If you’re using Linux you have to do some rfcomm stuff to set up the dongle. I got me one of those dongles. It showing it pair up with my bluetooth module. Not seeing any output on the lcd display tho. Dam i got to install linux on my laptop :(. I guess this is a good time as any. You can run Linux in a virtual machine while running Windows, check out Virtual Box. Until Zak starts selling these devices, does anyone know of a Windows or Mac program that emulates the look and function of this hardware? I really like the style! This is a great project , did yo think about using snmp as the protical to get the info out of the router , if you did that it would work with almost any router / modem on the market to day all you would need is a WiFi interface instead of a blue tooth etc . In my opion if you went this way it would make it ready for market . Hey, there doesn’t seem to be any cheap WiFi modules available at the moment, they all seem to be at least £40, otherwise I would have used that instead. Hi Zak, first of all, congratulations for the excellent job! I did this board one year ago during a project course at university and now I’m trying to set up a slave bluetooth module on it. My board is equiped with an ATmega324PA and I’m using the AVR suite (avr-binutils, avr-gcc, avr-gcc-c++, avr-gdb, avr-libc, avr-libc-docs, avrdude). 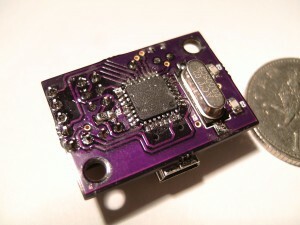 Do you have any idea what exactely I need to code to use this bluetooth module with my board? For now, I’m only able to plug the module on my board (VCC, GND only) and connect it with my MacBook. The connection LED stop flashing and stay solidly lit so I think I have a valid connection. I’m a little bit lost because all the examples that I found on Internet use the Arduino stuff. The Bluetooth modules output serial data, connect the TX->RX and RX->TX lines together and you should be able to receive and transmit serial data. This post might be helpful. Great project, great implementation ! this BT module is really a gem; cheap and reliable. It’s only drawback is the awful documentation ! In reset the module consumes 60uA (or maybe a bit less, it was going through a regulator which draws some of its own current, but I’m not sure how much). So if you need it to use less than 60uA then use a high side MOSFET to turn it on and off like in your link, otherwise just use the reset. Great !!! 60 uA is nothing, I will go for the RESET thing, since it is equivalent to the power cycling needed to enter the AT mode @38400.
could this hardware setup be used to stream video? No, it’s much too slow for that. would you have any ideas on how to create something similar to this in size possibly a little bigger that would have the speed to stream video? Sorry, all I know is that a fast ARM microcontroller is probably needed for that.